So you want to learn about words in Chinese? If you’re studying Chinese (Mandarin) and you need to learn Chinese words and read Chinese, you are in the right place. 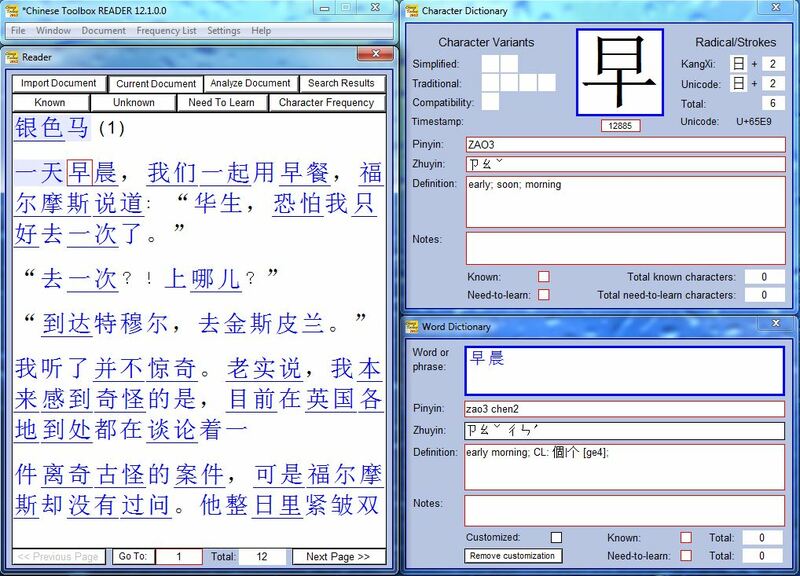 Chinese Toolbox is a Windows program to help you learn to read Chinese, characters and words. So if you have a few minutes, read through the rest of this page. It will show you how the words of Chinese can come alive for you. 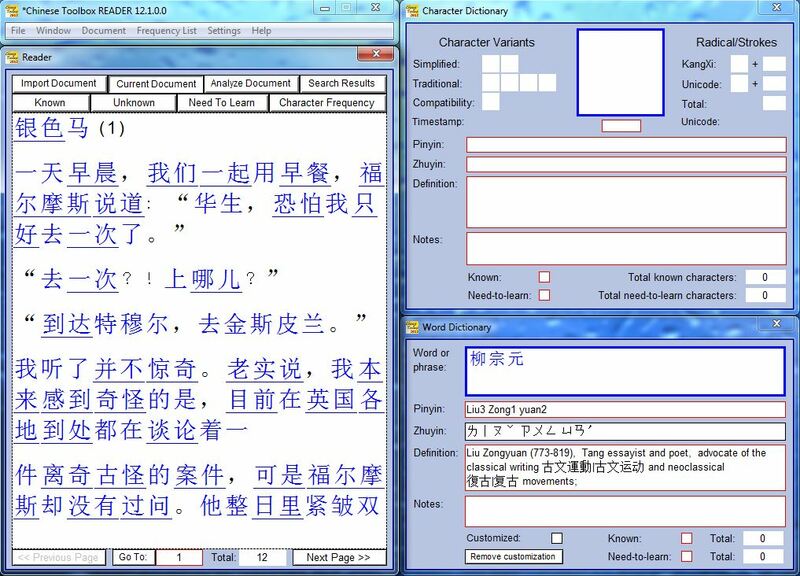 Let’s start with an example document, a story with lots of Chinese words. 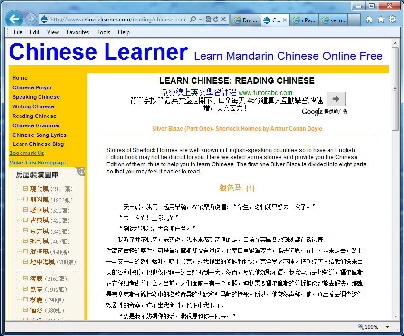 The text used in this example comes from www.chineselearner.com; it is the story “Silver Blaze” in simplified Mandarin. By the way, you can click on any of the screenshots below to show a larger version that may be easier to read. In the bottom half of the browser window you can see the first part of the story. Scroll down to show only the story. If you can read this story as it is in the browser, you don’t need to be here. But if not, continue on to see how to bring life to your reading of this story. Now, select this story and copy it to the Windows clipboard. 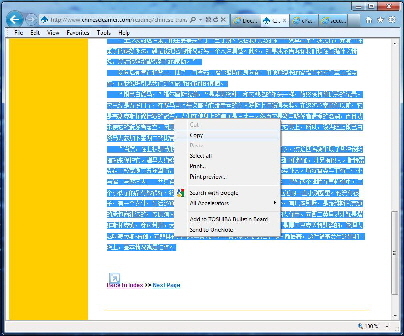 After selecting the text with the mouse, press Ctrl-c or right-click the text (shown below) and click on “Copy” to copy this text to the Windows clipboard. 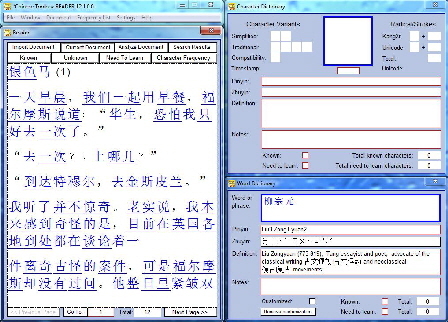 There are lots of options in Chinese Toolbox to change the appearance of text, but we’ll worry about that later. For now, notice all the underlines in the text. These are the multi-character words of the story. One of the challenging aspects of learning to read Chinese is knowing where words begin and end. 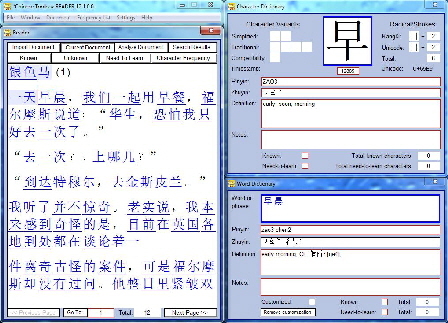 Chinese does not use spaces to separate words as in English or other western languages. 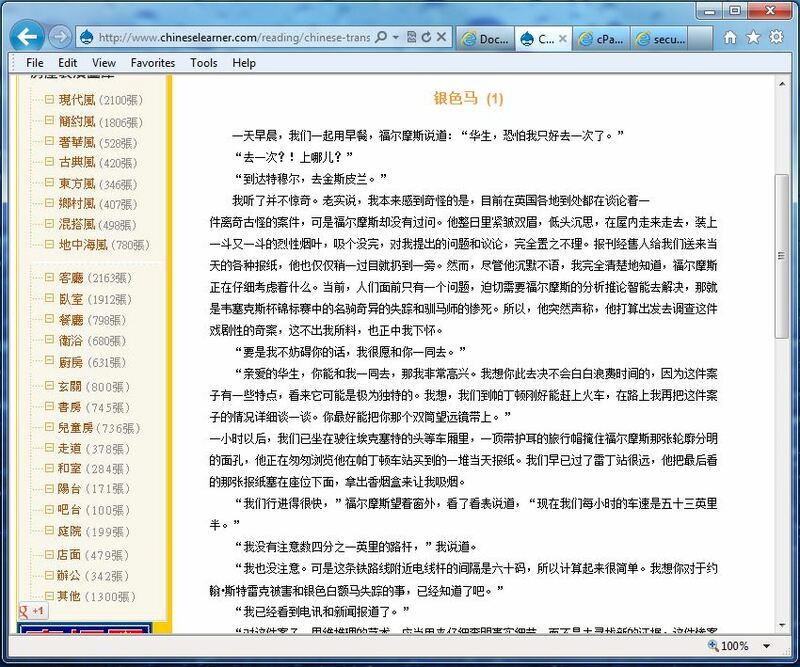 When you import a document, Chinese Toolbox parses the text, searching for words. When Chinese Toolbox finds a match, that match is underlined. What a difference between the web page version of this story and the story when viewed in Chinese Toolbox! Just knowing the word boundaries (as shown above) may be sufficient for more advanced learners of Chinese. However, Chinese Toolbox has a whole lot more to offer. 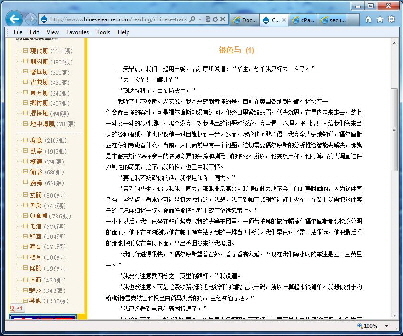 You can also just click on the character in the Reader with the mouse. Notice how definitions appear in the windows on the right. The upper right window (in the default layout) is the Character Dictionary window, and it shows the definition of the character selected in the Reader window (on the left). The word definition, similarly, is shown in the lower right window, the Word Dictionary window. Select a range of characters in the Reader. 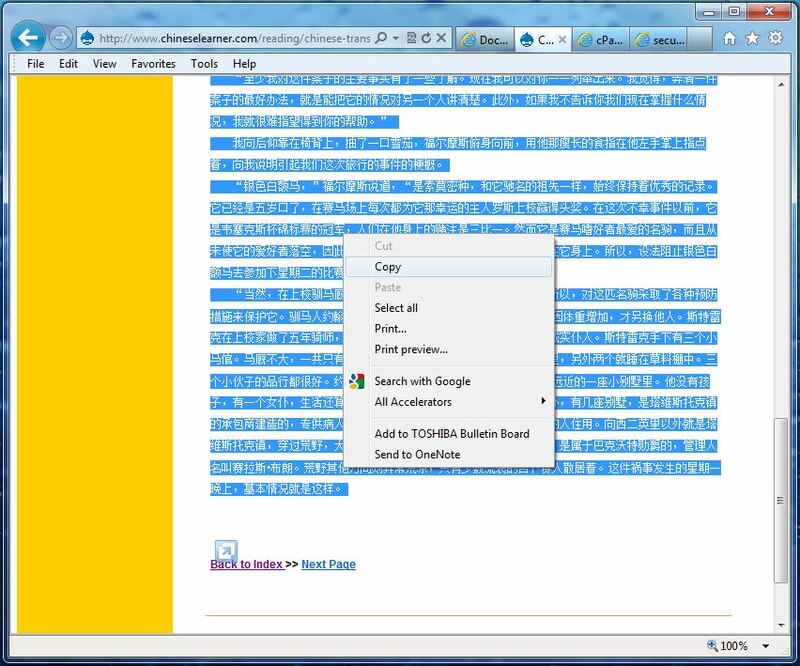 Copy the Reader selection, character, word or all reader text to the clipboard for use in other programs or websites. Mark a character or word as Known. Mark a character or word as Need-To-Learn. All of this is explained at chinesetoolbox.com. You can either check out the main Documentation page, or from the homepage use the Google search field to find what you’re looking for. What’s New give a good overview of the newest features in Chinese Toolbox.